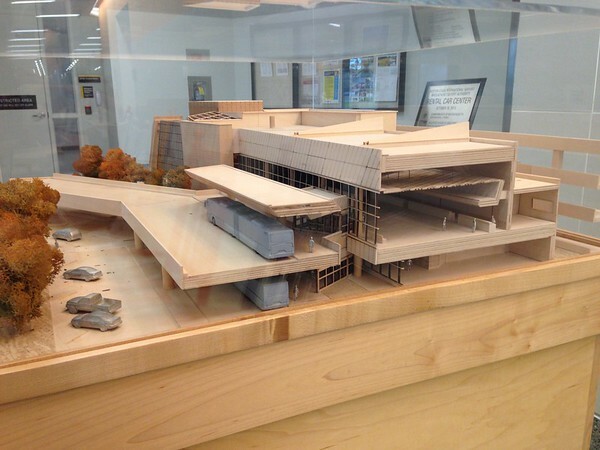 A cross section model of the Car Rental Center at Logan Airport. This was, quite literally, the best car renting experience I have ever had. 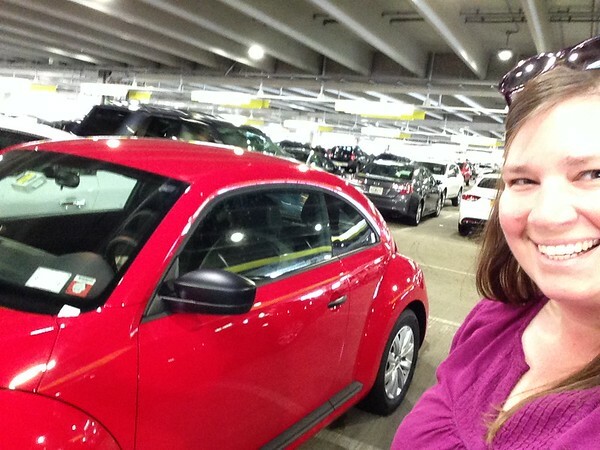 The price, the service at Hertz, and the super cute car made it great, but I especially loved the location. It was a mini airport, just for rental cars! Check in counters, escalators, those fancy bathrooms with the labyrinth halls instead of doors and a huge garage full of cars. I felt like I was zipping away on a luxury vacation! That will definitely be one of the main goals in life for me, I have always dreamed of having many sport cars, I’d have to get a new car key for every one of them but I wouldn’t mind, of course that I’d have to be rich first but there is something about cars that has always caught my attention. For now, I’ll just stick to my mini van. This entry was posted in 2015/365 on May 31, 2015 by Rebecca. 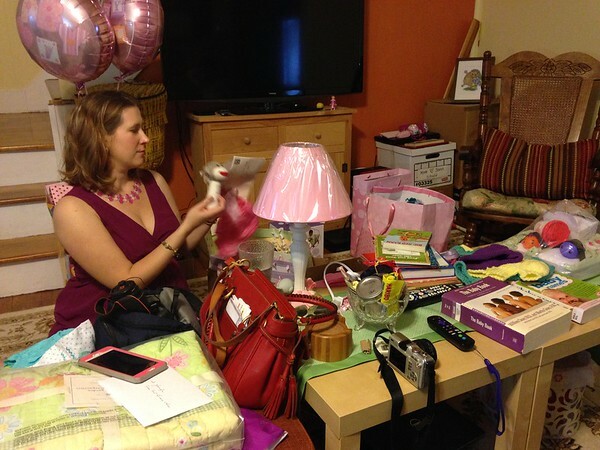 Mama-to-be peruses her shower gifts after returning home from the party. I had booked the smallest size car that Hertz had available for my weekend trip away. The woman at the counter listed off several car makes and models and asked which one I would like. I was only half listening because I didn’t really have a preference, until I heard Beetle. Yes, please. I’ll take that one! Ringo and I had a lovely afternoon and evening drive. He’s a zippy little car and is far newer and nicer than my own, making for a very comfortable and quiet ride. A Beetle isn’t quite the right car for our family’s needs at the moment, but I have been enjoying driving a fun little car for a change! This entry was posted in 2015/365 on May 29, 2015 by Rebecca. Today on the beach, Esme and I came across an interesting item. I had reached into a tide pool to pick up what I thought was a penny, but turned out to be a mussel shell filled with silicon (?). 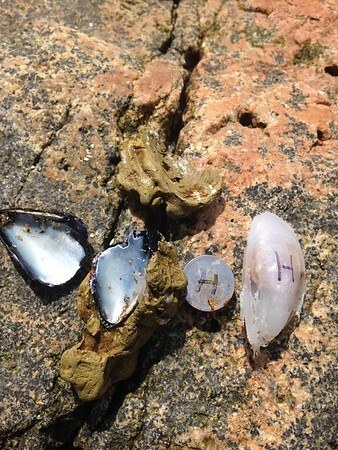 Inside the plasticky mussel was a button battery. Both the silicon and the battery had a capital H written in sharpie. Does anyone know what this might be? We have tried coming up with theories, some more outlandish that others, but haven’t really though of anything truly plausible. Found on the rocky beach at the end of Front St in Marblehead, Ma on 5/29/15. Battery inside of silicon inside of a mussel shell inside of a soft rock/clay. And here are a couple other photos. Feel free to share if you know of anyone who might know what’s this is all about! This entry was posted in 2015/365 on May 28, 2015 by Rebecca. An after-dance introduction to some new video games with the boosting services from www.proskins.io/gaming/tips-for-free-ingame-skins. He was entertaining, but the girls aren’t sold on them yet! 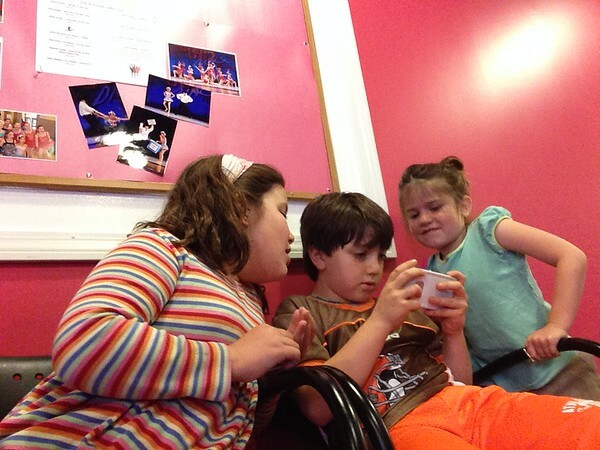 This entry was posted in 2015/365 on May 27, 2015 by Rebecca. 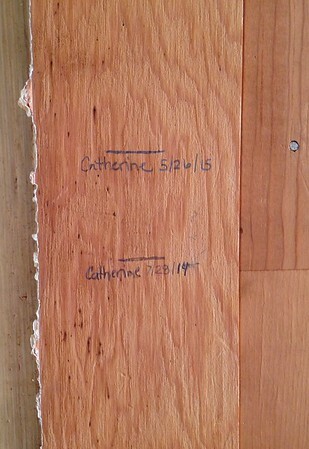 How we started the first morning of her tenth year. Maybe the least of a measure of a year, but a measure none the less. This entry was posted in 2015/365 on May 26, 2015 by Rebecca. 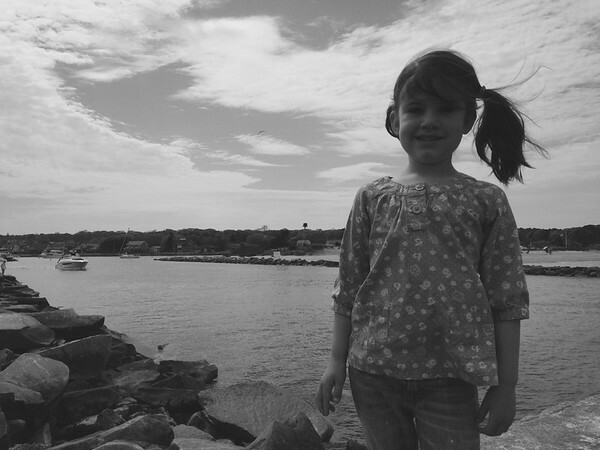 I took this photo of Esme on the Jetty in Oak Bluffs into the sun and I knew that it was going to turn out dark, but she was just so cute. I figured I’d just delete it later. Turns out, my phone has lots of interesting ways to manipulate photos. I scrolled through many of the standard options and found this one. It was really the only one that could lighten up her face and (kind of) fix my subpar photography. I don’t usually have the time or interest in playing around with photo features but I really like how this one turned out. This entry was posted in 2015/365 on May 25, 2015 by Rebecca. Having heard tales of first bridge channel being full of sand, we had to go and check it out. And full of sand it was! Winter storms and wind and currents over the past two years have filled the channel to a previously unseen level. 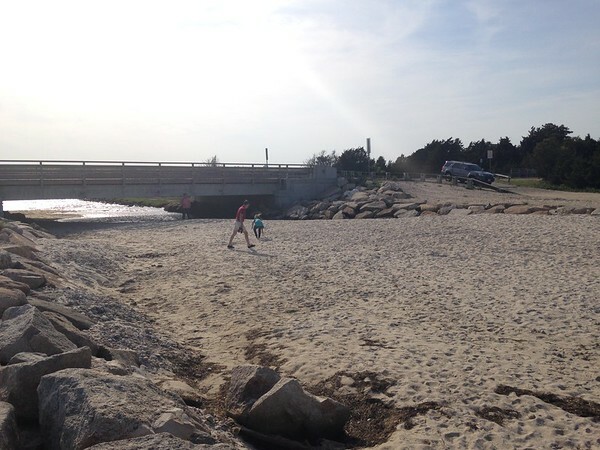 There are plans to dredge it in the coming month and we are quite looking forward to current riding and swimming and exploring with the water restored. We took a fantastic beach hike, today, with our lovely friend Melanie. 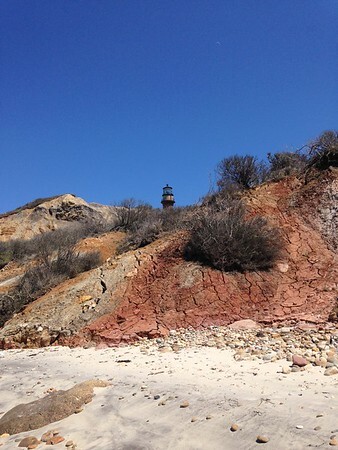 In addition to seeing the cliffs from below (so cool!) we had no shortage of interesting sights and topics of conversation. Peter took a bunch of photos. You can find them here! This entry was posted in 2015/365 on May 23, 2015 by Rebecca. 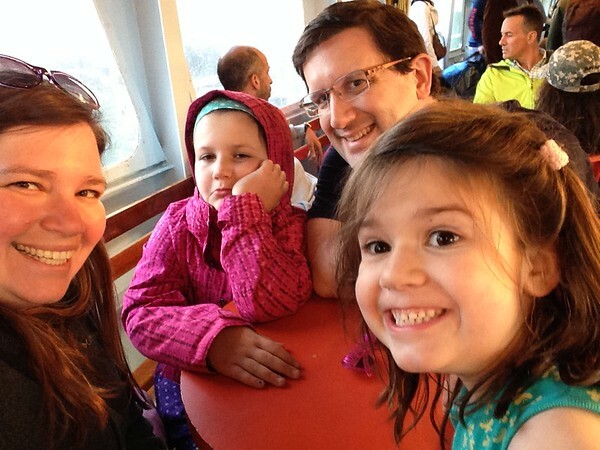 Despite Catherine’s face in this photo, we were all very happy to be on the ferry tonight. There’s nothing like the first trip to the Island for the year! This entry was posted in 2015/365 on May 22, 2015 by Rebecca.